Here is a really fun review product we recently received through TOS. It is an audio drama called "With Lee in Virginia" by Heirloom Audio Productions. First off, I must tell you, my children enjoy anything about the civil war, especially if it is about Lee or Stonewall. They read every book they can get their hands on regarding these two men. So, when I was offered the opportunity to review this set from Heirloom Audio Productions everyone was excited, including myself. The set arrived just before a family trip, so we held on to it until we headed out. This was not easy to do. After we were all awake enough to pay attention, we left at 6:30 am, and after completing our morning devotions we slid the cd into our car player. Within moments we were all held captive by the story line. Even my husband was listening as he drove. We finished one entire disc without any interruptions or pauses. The storyline follows a young man (15 years old), named Vincent and a portion of the life of Lee. Vincent fights alongside Lee in the war. I was actually intrigued by the beginning of the story that deals with a slave and how he escapes. You will have to listen to the tale yourself to find out the how and why. Your children will enjoy listening to this drama being acted out. You may recognize a couple of the actors and actresses voicing this audio drama. Sean Astin, Kirk Cameron, Chris Anthony and others. The story is based n a G. A. Henty book of the same title. Heirloom Audio Productions has three dramas already released counting With Lee in Virginia. We previously reviewed In Freedom's Cause, a story about Wallace and Bruce. We really enjoyed that one also! I have heard rumors that more adventures are coming! The study guide is great for homeschoolers as this can then become part of your curriculum. There are further studies, word definitions, maps and so much more. The guide is broken down into parts labeled by the disc it is on and the track you will be listening to. With the ages of my children, the youngest being 14 we like the Thinking Further section, but so much of this study guide is great for all ages. I highly recommend these whether you will be using it for school or just for family entertainment. Remember it is perfect for trips too! I also suggest that you click through to their social media and follow, so you will stay updated with future projects. I did! Be sure you take a moment to click the link below to see what other Crew Members thought of With Lee in Virginia. 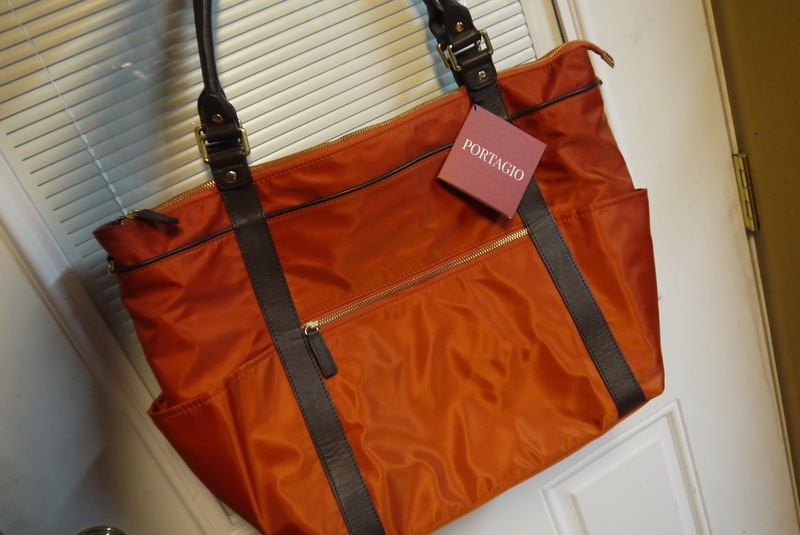 Traveling Days : Portagio Together Tote Review + Giveaway! Today I want to tell you about the Together Totes (I received the Cinnamon Colored Tote - Below) from Portagio! My sister is actually going to be using this tote for the cruise, as well as shorter trips. 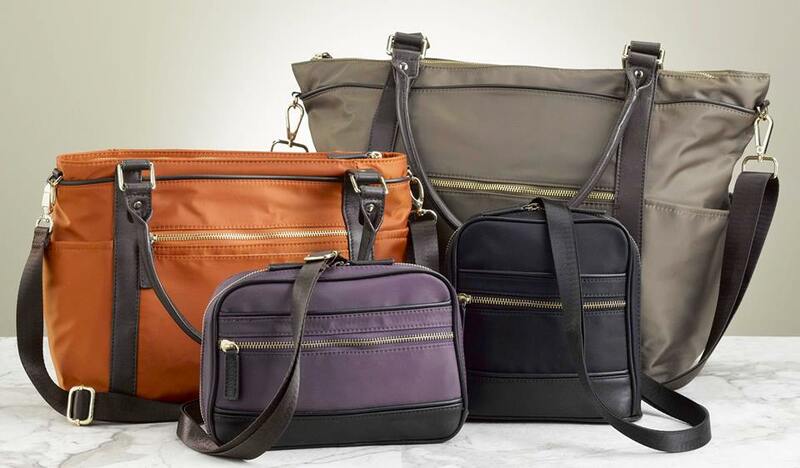 "Portagio is a new line of organizing handbags from Talus, specializing in organizational products since 1985.Based in Portland, Maine, Talus focuses on creating quality constructed organizing, comfort and convenience products to support busy lifestyles. Efficient Organization - Portagio handbags help you through full and busy days, organizing your essentials. Uncomplicated Styling - Portagio handbags are designed to dress up or down, with clean styling and classic lines to complement what you wear from the office to the gym and over the weekend - from dawn to dusk and beyond. Uncompromising Durability - Portagio handbags are built to last using only top quality materials that perform - tightly woven, bonded nylon that resists spills, scuffs and stains, and supple full grain leather that softens over time. Unconditional Value - Portagio handbags are sold directly to you - there are no store operating expenses or online marketing costs that you pay for when you buy a handbag from us. As a result, you get a high quality handbag with excellent construction and organization at a price you can afford." -- Taken from the Portagio website. The Together Tote has many great features that people look for in a tote bag, but don't always find. 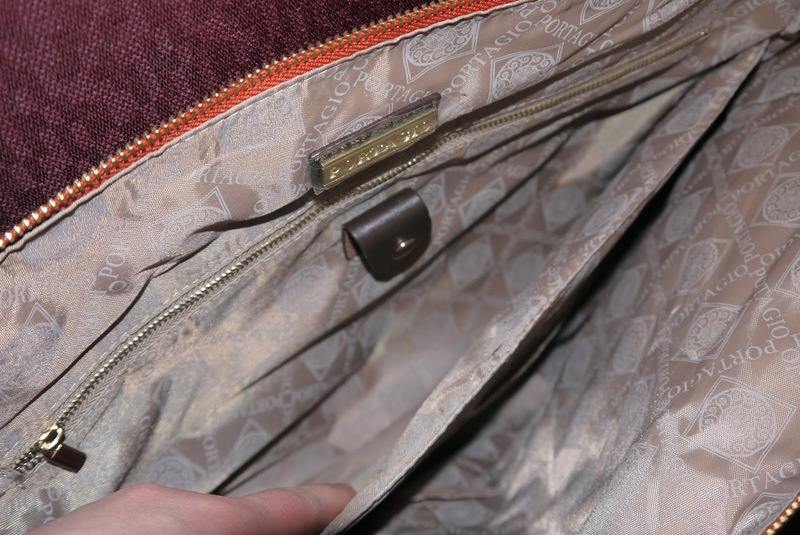 I will tell you about several of the features, but one of my overall favorites is that there is an interior "pocket" that is padded for your electronics. I hate having to bring along an extra bag for the electronics! 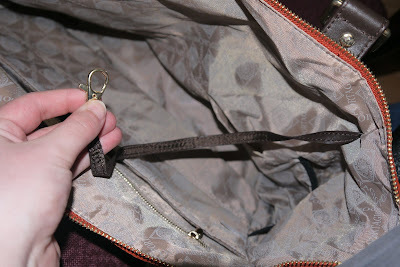 There are many pockets both inside and out, including two interior pockets made to put bottles in. How neat is that? You can even bring two water bottles, sodas, etc. in your tote. Another nice feature is the leather key fob. It is always a huge pain when you toss your keys in your bag and can't find them.... no longer! 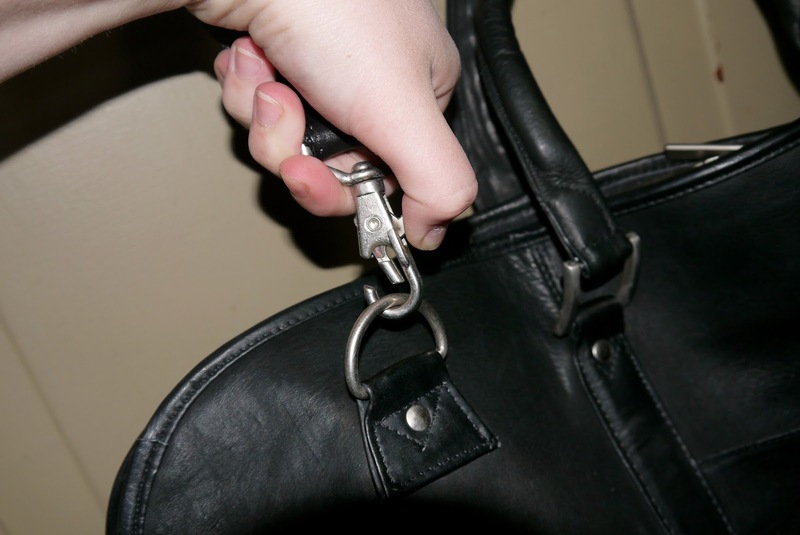 The Together Tote has a leather key fob that is attached right inside the bag, so that it is easy to fish them out. This tote is definitely worth purchasing whether you want to use it as an overnight bag, a gym bag, a weekender bag, a carryon, to bring home groceries, etc. You can purchase the Together Tote from Portagio Bags at www.portagiobags.com as well as other products. You will not regret it! You can also Like them on Facebook and Follow them on Twitter to stay up to date with their latest news. 1 Neighbor will Receive a Bag of their Choice from Portagio Bags! 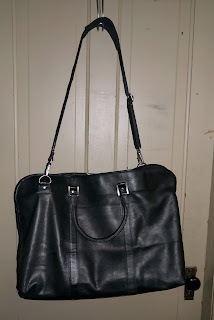 Traveling Days : Wilsons Leather Review + Giveaway! Today I want to take a few minutes to tell you about my awesome Marc New York Leather Duffel w/ Detachable Strap I received for review from Wilsons Leather. I have used this on several trips recently, and it works great for my needs. Before I tell you about my duffel, I want to give you a little bit of information about Wilsons Leather. This duffel is going to be perfect for our cruise in February as a carry-on bag. It will be large enough for me to put in the recommended extra outfit, electronics, etc., and yet not so big that I can't carry it around comfortably. I have received many compliments on my duffle, just because it looks so nice and stylish! It is lightweight, yet seems to be made very well. I have "stuffed" it quite full, and it holds up very good to all of my packing, being thrown up into the cartop carrier, etc. And, since it is leather, dirt just wipes right off of it with a damp cloth. The leather strap is detachable (above) if you prefer to just use the handles, but there is a shoulder pad on the strap (below) that is very comfortable. Did I mention that I love the leather? Well, I do. It smells great, looks great, and works great for what I need it for! I am very pleased with my duffel and Wilsons Leather. This is definitely worth purchasing if you need a duffel bag as a weekender bag, a carryon, or anything else. You can purchase this as well as many other leather products on the Wilsons Leather website. You can also Like them on Facebook and Follow them on Twitter to stay up to date with their latest news. 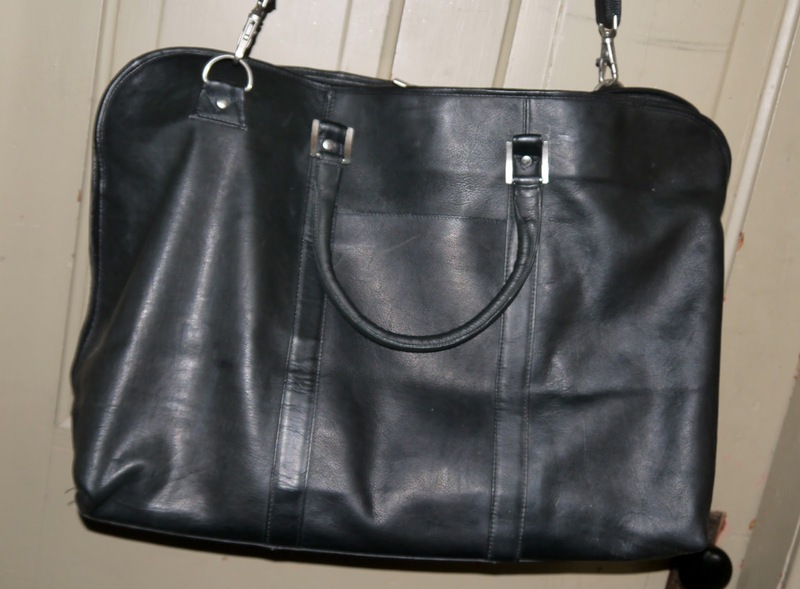 Marc New York Leather Duffel w/ Detachable Strap! Let's see how many entries we can get over the weekend. I have one coupon for a free Renuzit Pearl Scents. Also included in this giveaway is a Vanilla Blossoms Moisturizing Body Spray and an Autumn Spice Wax Melt. Oh, and I threw in a Lavender Papaya Body Bar! So lets see how many people will enter and share this post! The Red Classic Watch from Flex Watches! "Born and raised in Southern California, the Flex founders grew up around the latest trends in apparel, music, and fashion. In 2011 they created a watch to raise funds for the impoverished children of Rojo Gomez Mexico. Following a successful fundraising campaign (providing over 15,000 meals) they decided to expand. 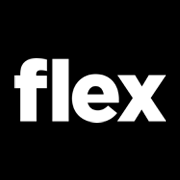 In 2011 Flex partnered with over 20 organizations encompassing everything from fighting cancer and helping injured veterans, to providing clean water and food to children in need. Flex was eventually integrated into MTV’s “The Real World” and worked closely with cast member Nathan in 2012. After handling the initial growth Flex moved into it’s own office in San Diego, hired employees and grew into a fulfillment center in San Francisco. We are simply "People Helping People." We are forever grateful for our thousands of campus reps and our tens of thousands of customers that have made this all possible. Without you we are nothing. Thank you and we hope you continue to follow our journey. Flex Your Cause!" 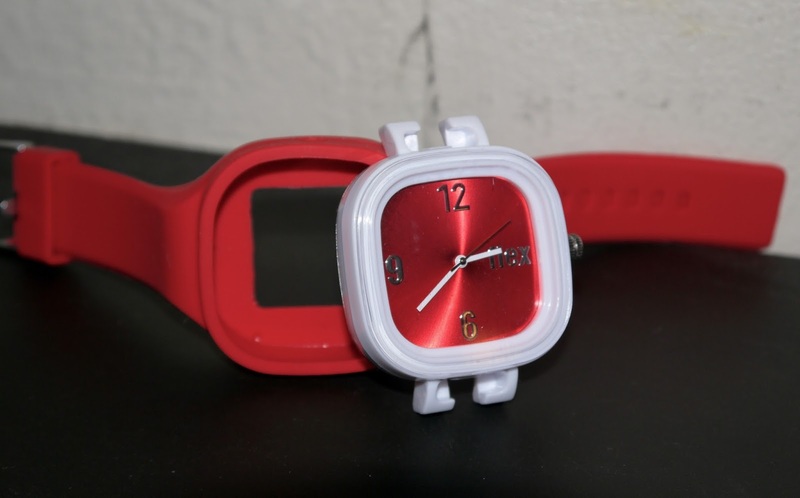 This sports watch has a interchangeable face/band, so that you can swap the face out with other bands, or the band out with other faces! It looks very flashy, and yet classy, and is sure to catch the eye. Nowadays a lot of people don't wear watches anymore because of all of the electronics, but I think it kind of dresses up an outfit, and can add just the right touch. It's also annoying to have to keep pulling out your phone or iPod to check the time when traveling, just wear a Flex Watch! 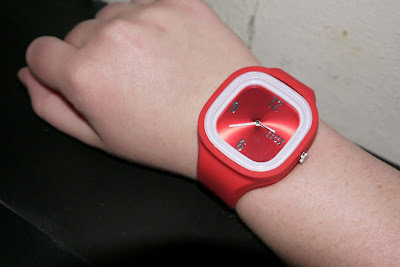 I love how comfortable the silicone watch band is... 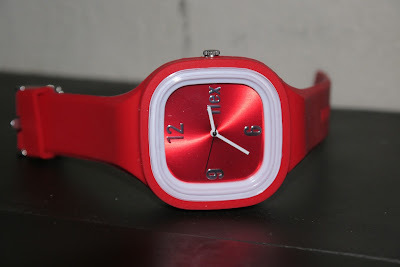 I alway hated when the bands were stiff or cut into the wrist, but you won't have any trouble with this watch. This wristwatch is definitely worth purchasing. 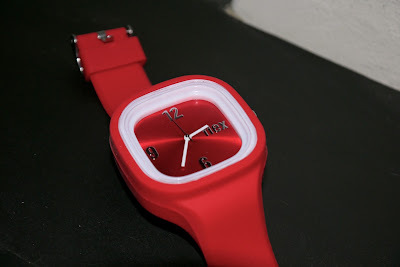 You can see the other products and styles available on the Flex Watches website, as well as Liking them on Facebook and Following them on Twitter. I received no monetary compensation for this review and giveaway. All thoughts and opinions are mine. All text in red is taken from the sponsor's website. 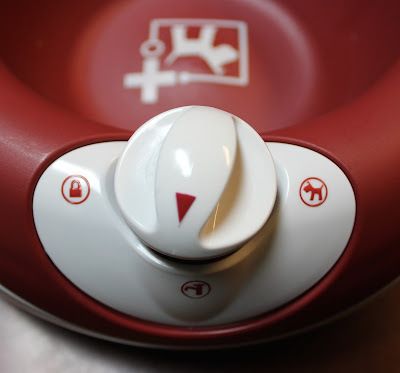 Today I want to tell you about a product that is an absolute necessity for a traveler that spends a lot of time in the sun, but even more for those (like myself), that burn easily. The one part of the cruise that I am not looking forward to, is how sunburnt I will come back. Somehow I burn no matter how much sunscreen I use, if it is overcast, etc. My siblings think it is funny, because after we've been out in the sun for a while they will come in with slight burns that slowly tan, and I come in bright red with burns that take a bit to heal, and as a result my skin peels off and I am the same paler skinned person I was before being out in the sun. :) Coolibar can REALLY help with that problem. "Founded in 2001 by an Australian who knew the harshest of sun climates, Coolibar has evolved to be the leader in innovative sun protective fabric design. Headquartered in Minneapolis, Minnesota, Coolibar takes its name from a eucalyptus tree native to the Australian outback - offering welcome relief and reliable protection from the sun's damaging ultraviolet rays, on the continent where sun protection began. Coolibar is the first company to receive the Skin Cancer Foundation's Seal of Recommendation for sun protective clothing. 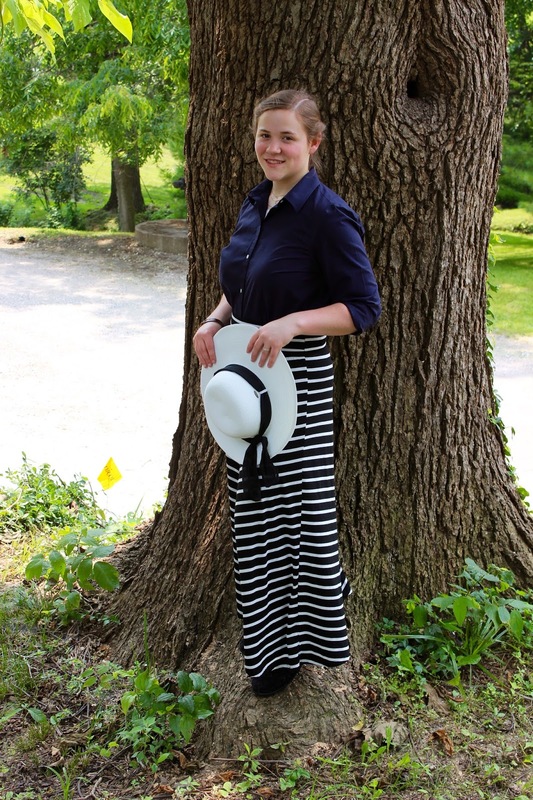 Additionally, our sun protective apparel was the first ever endorsed by the Melanoma International Foundation, and as a sun protective clothing company Coolibar has also been endorsed by the Pediatric Sun Protection Foundation." "Teach kids that being safe in the sun is as important as wearing a bike helmet! Limiting sun exposure now helps prevent skin cancer in the future. Make sure to wear lightweight clothing that is tightly woven (t-shirts do NOT block UV rays! ), and contains a UV protection factor of 50. Keep sunscreen and a hat in your gym/travel bag, stroller or diaper bag so it¹s always accessible when needed. Apply sunscreen 15-30 minutes BEFORE going out in the sun, and remember to reapply to exposed areas every two hours, and more often after swimming or sweating. Take regular breaks from the sun especially between 10 a.m. and 4 p.m., when UV rays are strongest, and make sure to drink lots of water. Set your phone¹s alarm for reminders. 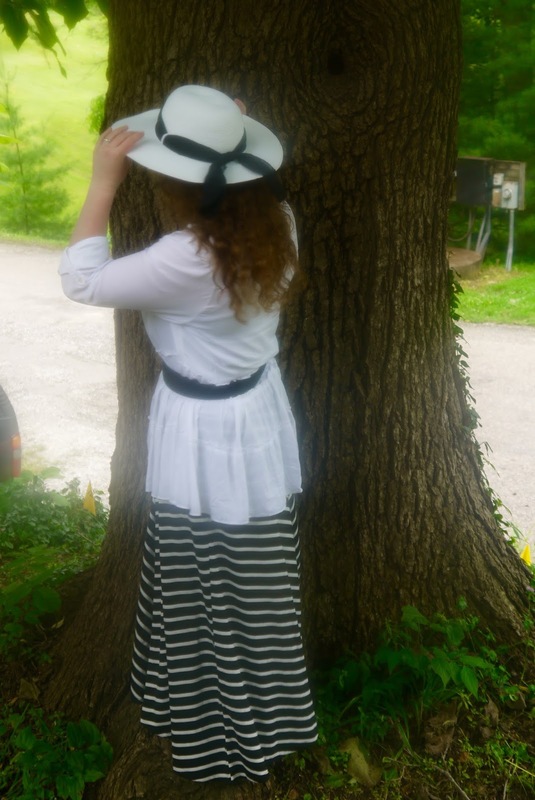 Wearing a wide-brim hat provides extra coverage to the neck and shoulders. 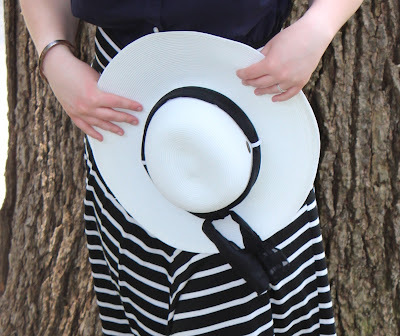 Every inch of hat brim can lower your lifetime risk of skin cancer by 10%. Wear a swim shirt specifically designed for water activities while at the pool or beach. These provide maximum sun protection, cover a large amount of exposed skin, and dry quickly so they are great for trips. Wear sunglasses. In addition to protecting eyes from UV exposure, another cancer risk, the right sunglasses offer impact protection, and reduce reflection if you are participating in any rigorous activities." As you can see, I enjoy pairing my hat with this striped maxi skirt... I think they go so well together! 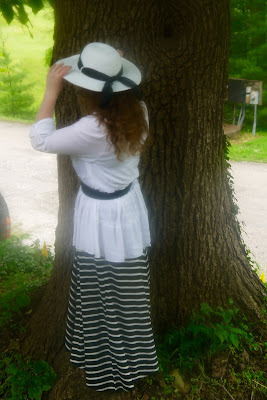 This is definitely a hat/outfit that I will be packing for the cruise. 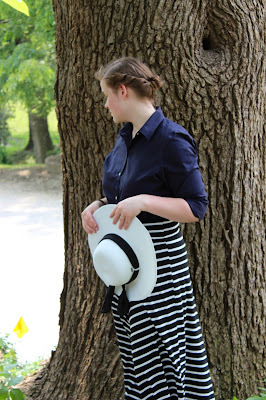 I love that I can wear it with a dressy outfit (above) or a more casual, but still stylish, outfit. The 4" front brim is perfect for keeping the sun off of your face, and it also has the "SmartStrawTM fiber - packable, crushable, salt resistant, easy care" which is perfect for traveling. I hate when a hat gets crushed, loses all of its shape, and is ruined. Another of my favorite features is that the scarf is removable, so I can trade it out with my own and it can coordinate perfectly with any outfit. It is definitely worth purchasing this sun hat. I have received many compliments, and also those that would like to "borrow" it. 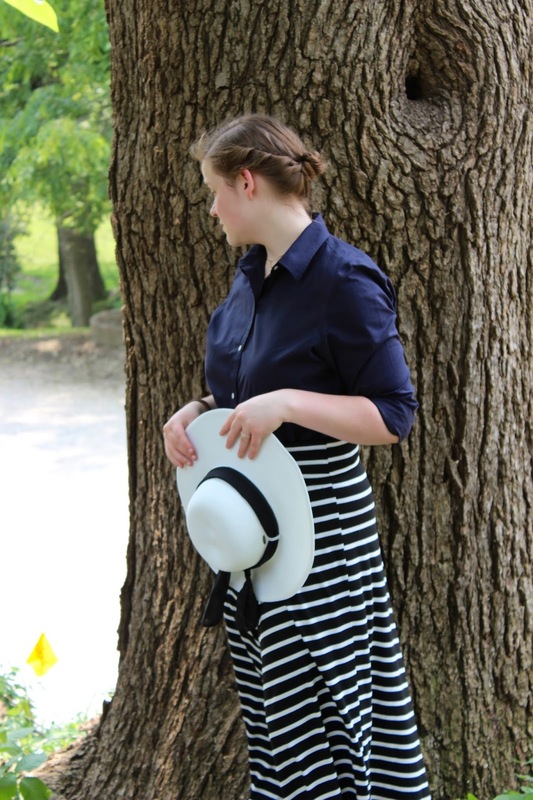 :) You can purchase this sun hat, as well as many other sun protective items, on the Coolibar website. You can also Like them on Facebook and Follow them on Twitter to see updates from them in your feed (such as the sun protection tips shared above). 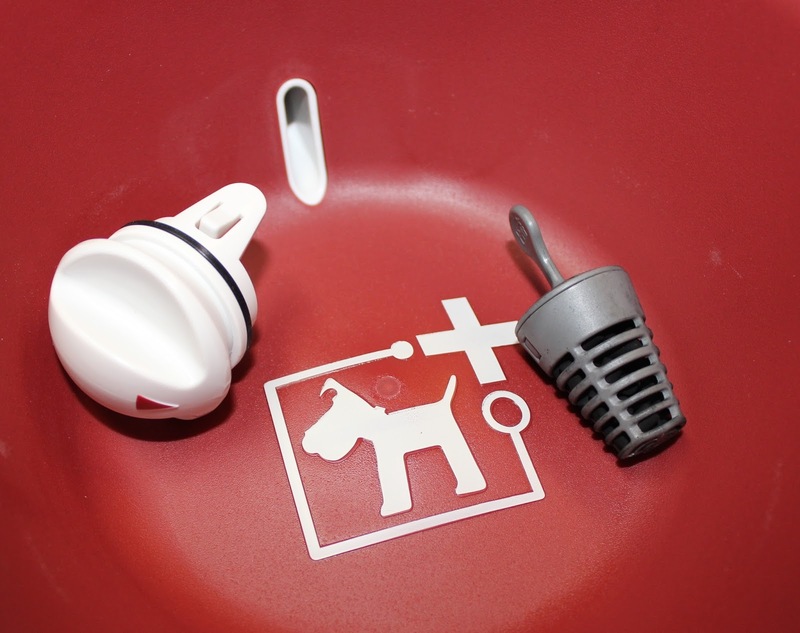 Here is a really great product for your pets for home and travel! From Heyrex we have the Torus Filtered Water Bowl. 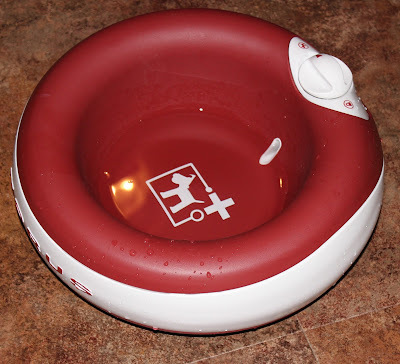 This is a water bowl for our dogs that I really like. It is designed to both filter and regulate the water, along with helping keep it cool. After opening our Torus bowl, I inserted the filter and filled it with water. The filter goes in the hole where the cap is. Once filled, replace the cap and turn it to the locked position. 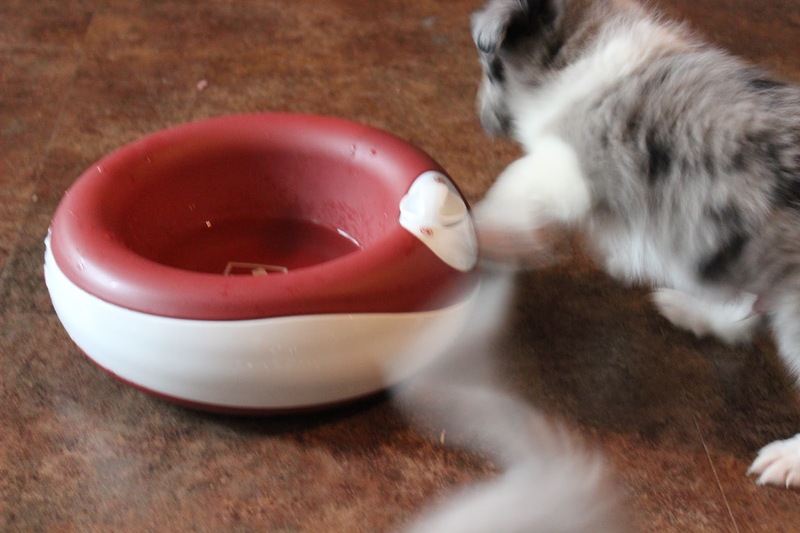 This will allow you to carry the bowl without any water releasing into the actual bowl. Perfect for travel! When you have the bowl placed where you want it just turn the cap to point to the dog and water is released to fill the dish. 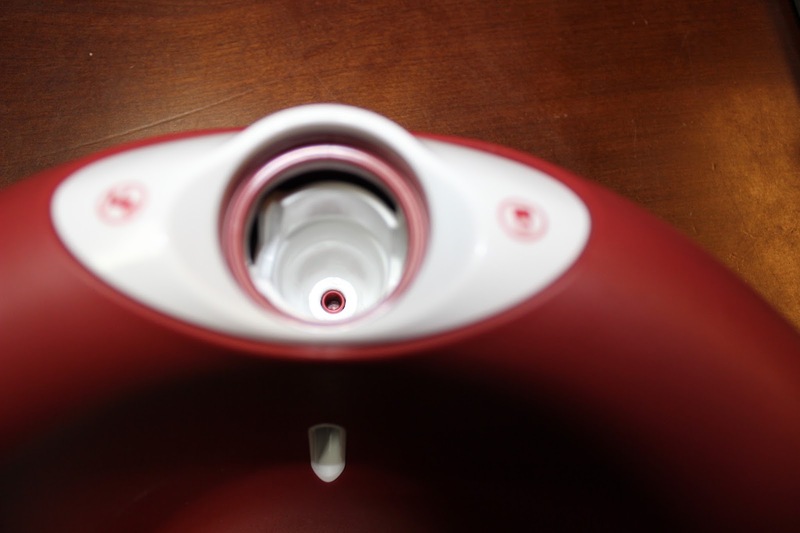 The reservoir holds up to 2 liters and will slowly replenish as your pet drinks. 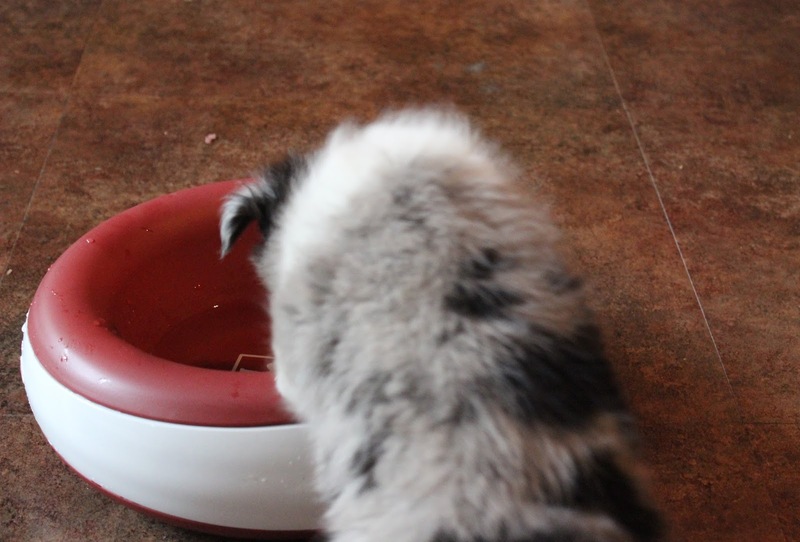 The bowl has thick walls that help to keep the water cool. 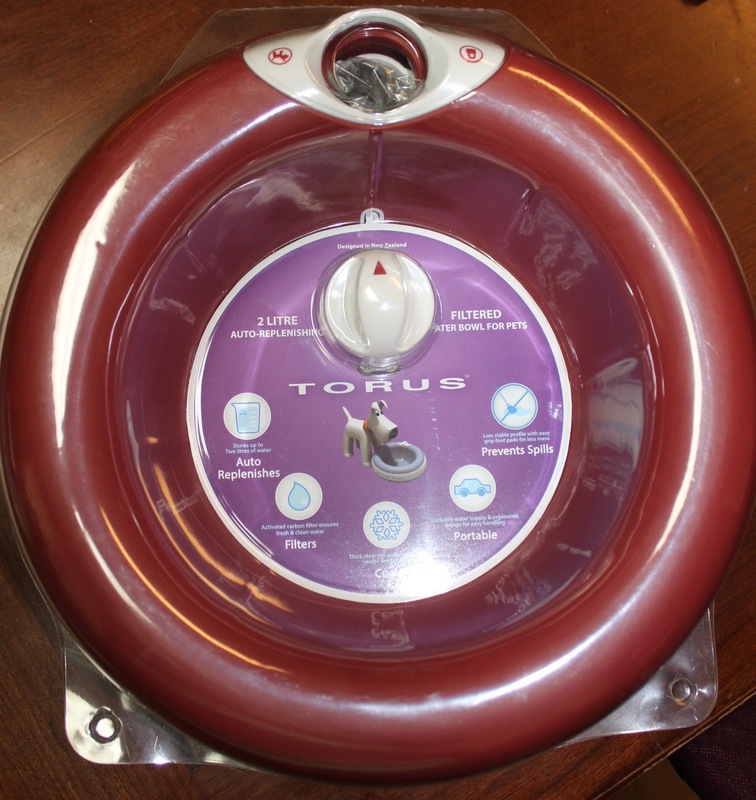 The Torus bowl is also more difficult to tip over because of it's design. There are also easy grip foot pads to help keep it from sliding. All of this adds up to a happy mom! 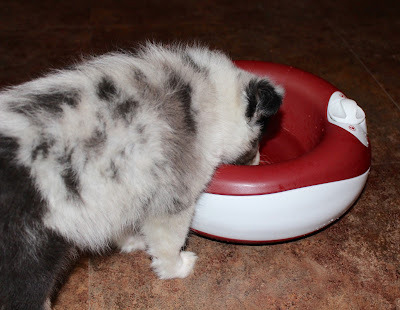 Now I have no large wet spots on the floor from an overturned dish or a dish that is now sitting in the middle of the walkway from sliding. The filters should be replaced approx. once a month to help keep the stored water in the bowl fresh. You can purchase the filters directly from Heyrex. 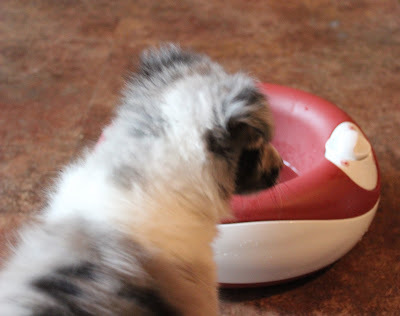 We have used the bowl for Pansy, of course Trixie drinks from it too. 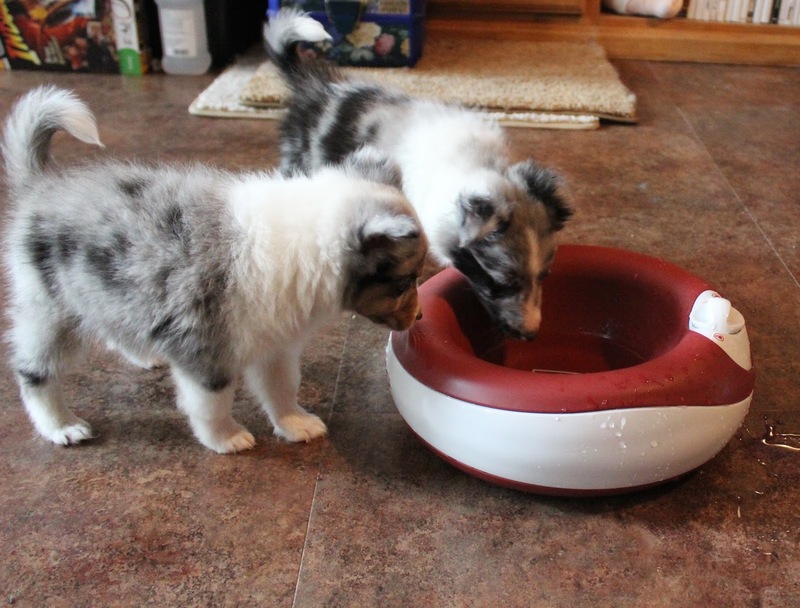 We also tried it out with the puppies. It works great for them too! What do you think of the Torus water bowl? I am impressed! 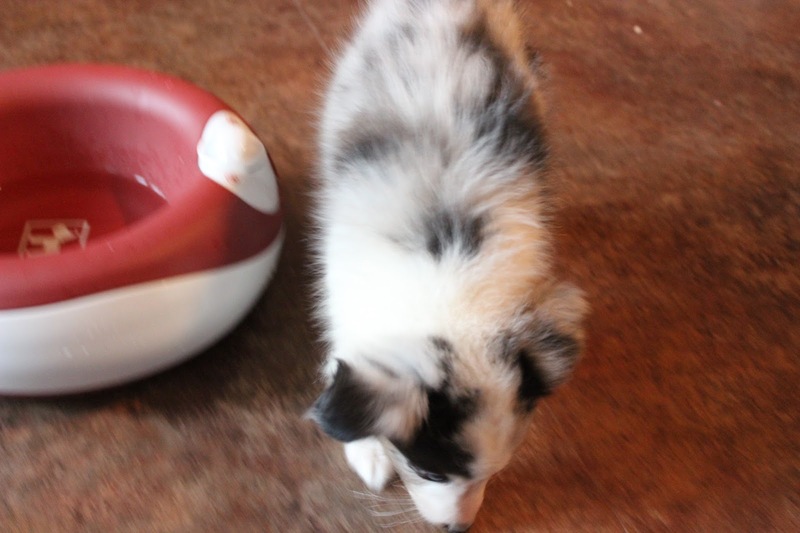 We will definitely be using the bowl on trips! 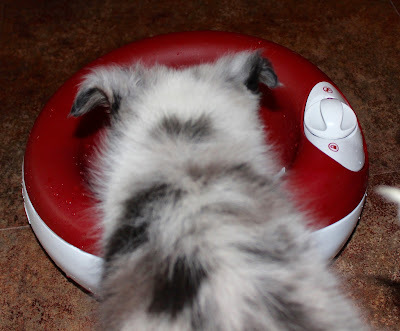 The good news is, one neighbor will also be receiving a Torus water bowl from Heyrex. Enter now and thank you for stopping by! 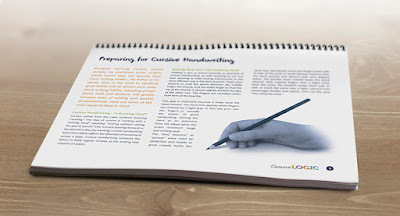 Here is a review of a homeschooling curriculum that will assist you in teaching your child to write in cursive. We received the CursiveLogic Workbook from, CursiveLogic of course! 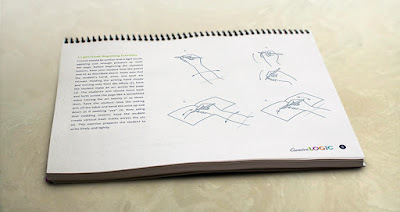 Before I begin the review I want to share a little bit about how I feel regarding handwriting. We have a friend who teaches at a public school in Florida and she told me that they are no longer requiring students to learn cursive. Now, I am a little amazed by that. I mean, how are they going to sign important documents, checks or even read many of our country's historical documents? All of my children have been required to learn cursive. I realize with all our electronics and such we have made cursive writing less of a necessity, but I still feel it is an important skill to learn. So, if you feel the same way, continue reading about CursiveLogic. 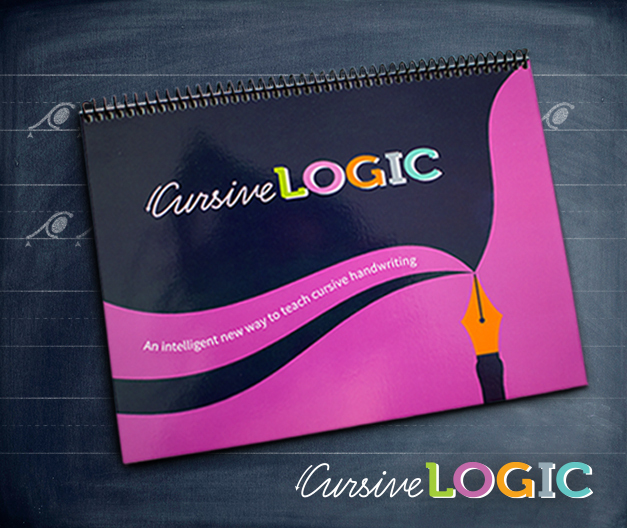 The CursiveLogic Workbook is an extremely organized method of learning. Instead of learning the letters in alphabetical order, the letters are divided into four basic groups that have similar shapes. Thus your child will learn a group of letters instead of learning individual letters one at a time. They are broken into a string of letters that are similar. To help your student learn each group or string is color coded. Having the color coding is another way to help the student remember the shape of the letter. 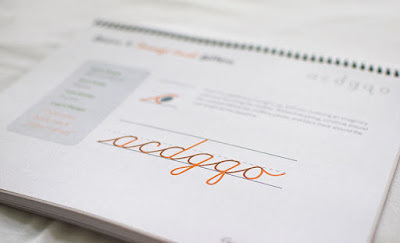 Another benefit to learning like this is, your child will be able to write a word at the end of a lesson, because they are learning a group of letters, rather than one letter at a time. One of the very first things CursiveLogic will teach is the proper way to hold your pencil or pen. Also included in the introduction section is the proper posture to use when writing for both left-handed and right-handed writers. Even I remember learning that in school, although I am not sure it is taught any longer. 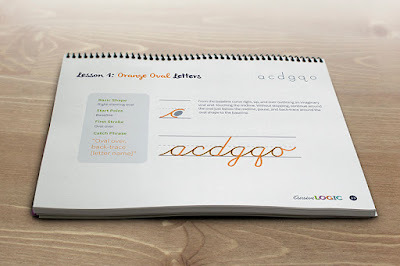 Once your child has finished the preparation for writing in cursive, they will be able to jump right in to Lesson 1 where they will learn about the Oval Orange Letters. Yes, that does give away a hint on the instruction, but there is so much more included in CursiveLogic. As I stated above, this is a very logical and methodical way of learning to write in cursive. Not only do I recommend you include cursive in your curriculum, I recommend CursiveLogic. 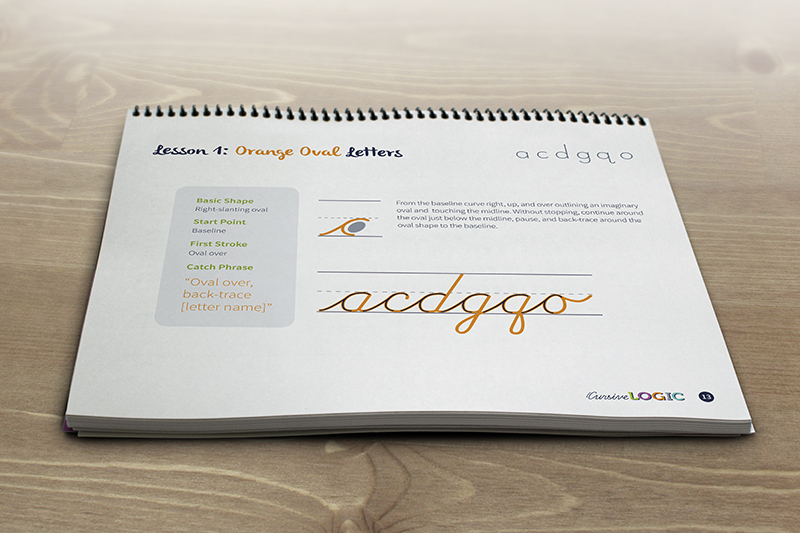 It is by far one of the easiest methods I have seen to learn cursive. Take some time to visit their website and take a look around. You can download some sample pages to get a better idea of how CursiveLogic works. Be sure to follow them on their social media to learn more. Other members of the Crew also reviewed the CursiveLogic Workbook and if you click the banner below you will be able to see their thoughts and opinions. 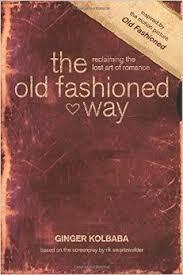 Remember a few weeks ago when I reviewed the Old Fashioned DVD? Well, here is the review on the book the movie was based on and the accompanying devotional. The novel is by Rene Gutteridge and if you have read my movie review you have an idea of the storyline. For those who did not see the previous review, I will give a short recap. Basically Clay Walsh a former frat boy who has lived a little on the wild side, decides to turn from that life. He is now running an antique shop sporting unique ideas on dating and courtship. Into his life steps Amber Hewson. She has a free-spirit outlook on life, traveling the country from town to town as she feels led. This is where the two worlds collide. Clay is interested in Amber, but Amber, although she enjoys his chivalry, finds his rules a bit restricting. You will have to read the book to find out what happens and see who changes. The devotional, Old Fashioned Way is designed to go along with the dvd and book. The devotional is designed to give you a look at the way God designed love and to help bring romance into your relationship. I will say, I do not recommend this set to teens as they do cover some of the previous life. If you are considering giving it to a teen my suggestion is to preview it yourself first. Have you ever started out on a road trip with your car all clean, organized, and everything in just the right place? Then after a day of driving, not to mention unloading and repacking the car after a hotel stay, the car doesn't even look like the same vehicle anymore! I'm sure anyone who's traveled at all has had this experience, as we have many times. We've been taking a number of 3-7 day road trips this year (and have more planned), so getting our vehicle to stay organized on said trips became a priority. That's where Talus Products comes in! I received the High Road Kids Large Food'nFun Seat Organizer for review, and wasted no time in getting this set up for our upcoming trip. This organizer is simply amazing! 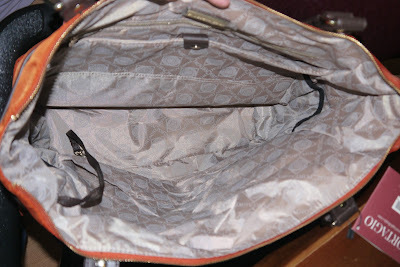 The inside is actually a cooler, so you can keep cold drinks and snacks handy throughout a trip. We normally bring a full size cooler on our trips, so this will get turned into a book bin more often than not! Perfect for keeping books, notebooks and such neatly organized and free from damage on trips. 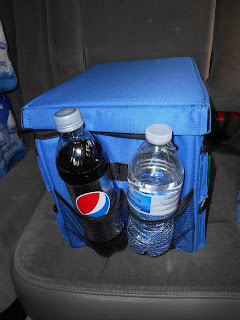 We will give it some use as a cooler too though, on day trips where we don't bring a big cooler along. All along the outside of the organizer there are pockets of all sizes for all kinds of uses. 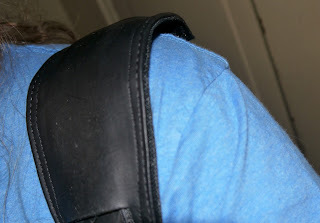 The front has two elastic pockets for drinks or bottles (so they don't get tossed on the floor or spilled all over the seat). The other pockets will hold just about anything you need. Pens, crayons, books, toys, an iPod/mp3 player...whatever your children normally bring along in the car. The top of the organizer also doubles as a lap desk, so if the kids want to color, draw, or write in the car they can. This is seriously a lifesaver for any family who travels!! Make sure you check out Talus Products before your next road trip; they have so many great travel products! !